Depois de, em 2011, o Met Museum em New York, nos ter presenteado com uma exposição sobre a obra do grande Alexander McQueen - Savage Beauty [tive o prazer de ver - as criações perfeitas, a excêntricidade do génio, a cenografia do espaço - tudo perfeito], chega agora a vez de Isabella Blow, a excêntrica editora de moda britânica [amiga íntima de McQueen e de Daphne Guiness] que sempre supreendeu com os seus outfits compostos por chapéus surreais e saltos vertiginosos [deixa saudades] ter uma exposição dedicada a si - Fashion Galore! - na Somerset House em Londres. A exposição começa amanhã e termina a 2 de Março. Pela personalidade de Isabella, pelo que trouxe ao mundo da moda e pela sua coragem, vale a pena marcar uma viagem a Londres. Em Fevereiro estou lá! The exhibition that was missing! 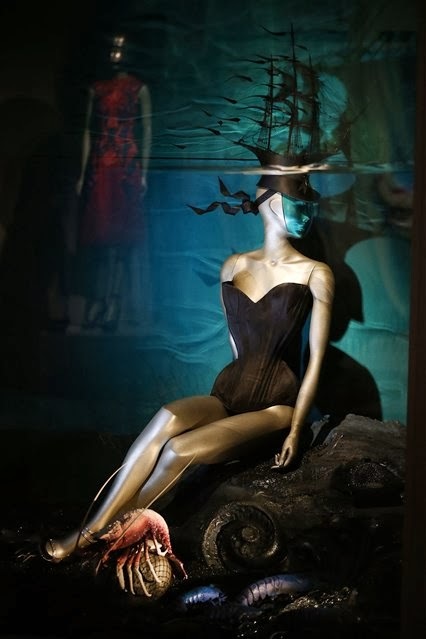 In 2011, the Met Museum in New York, presented an exhibition about the work of the great Alexander McQueen - Savage Beauty [I was pleased to see - perfect creations, the eccentricity of genius, the scenography of the space - everything perfect], now comes the turn of Isabella Blow, the eccentric British fashion editor [close friend of McQueen and Daphne Guinness] who ever suprise us with her outfits composed by surreal hats and vertiginous heels [leaves longing] to have an exhibition dedicated to her - Fashion Galore! - at Somerset House in London. The exhibition starts tomorrow and ends on March, 2nd. Because of Isabella's personality, for what she brought to fashion world and because of their courage, worth schedule a trip to London. In February I'm there!